Jesus promised His disciples that even though He had to depart this earth, He would “come again” (John 14:3). An angel confirmed this truth to His disciples as Jesus left the earth some 2000 years ago from the Mount of Olives. The prophetic hope of Jesus returning to Jerusalem as King of the Earth has comforted myriads of Believers through the years. And return He will. 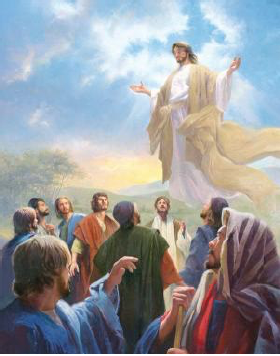 Following 7 years of horrific seal and bowl judgments on the earth, Jesus physically returns to earth with a landing of seismic proportions on the Mount of Olives, completing His wrathful objectives. This Second Coming coincides with the much-prophesied conclusion of the “Day of the Lord.” It’s Jesus’ booming climactic conclusion to His “bowls of wrath” judgments that He had been unleashing on a sinful earth. Jesus’ Second Coming is in two distinct parts: First to the Jews in the desert and then in the final battle with Satan. Jesus first returns to reveal His crucifixion scars to the Jews who refused to accept Him as their Messiah 2000 years ago. These Jews will have been living in the desert for 3 1/2 years. 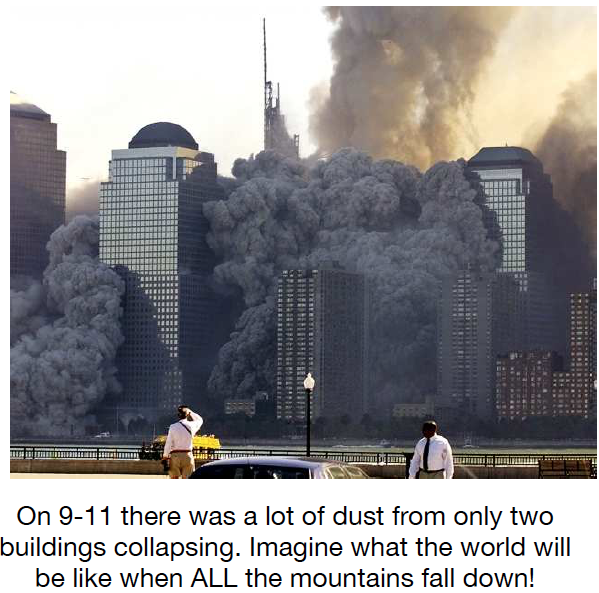 This is because halfway through the Tribulation, those Jews who were attentive to the Bible’s warnings left all their worldly possessions to flee when they saw the Abomination of Desolation standing in the rebuilt Jewish Temple. They that made it out alive ultimately gathered in the wilderness where they were protected from the last 3 1/2 years of Satan’s unholy rule on earth. Isaiah 2 says the place to which the Jews will flee will humble them as they live in caverns, tombs and rocks. 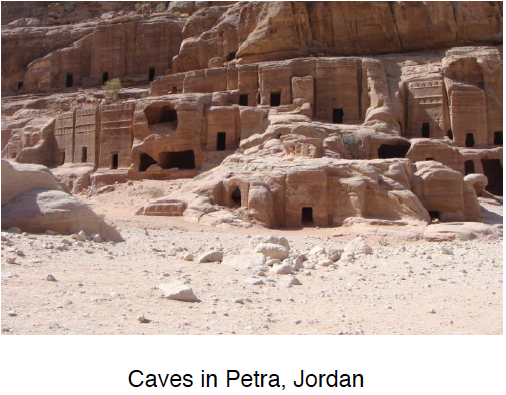 When Caves in Petra, Jordan the Abomination of Desolation stood in the Temple, those who dropped everything and made a beeline out of town were part of the 1/3 of the Jews to survive that day. Those that went back to grab anything worldly were captured and killed. But at the end of the 3 1/2 years, the Jews hear the Antichrist is coming with the armies of the world to wipe them out. The 3 1/2 years they spent learning to depend on the Lord must have been good for them because they cry out to the Lord and He answers their prayers. He comes to them and they brokenheartedly see the scarred hands, side and feet from His crucifixion. This is the nation of Israel’s “Come to Jesus” moment. Next Comes The Final Battle After reacquainting Himself with the surviving Jews, Jesus then departs to wipe out the Antichrist’s world army of nations who had joined forces and gathered in the Jezreel Valley. Armageddon, seen above from Mt. Carmel. Note the Israeli air strips that will undoubtedly be used. 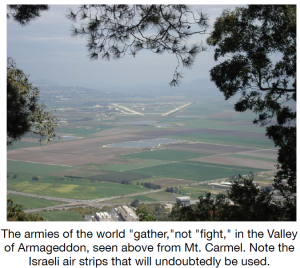 (the battle takes place elsewhere, the armies only “gather” at Armageddon), Jesus wipes out the armies of the world who were marching to kill the remaining Jews in Petra. But not much of a fight, God always wins. Jesus then heads to the Mount of Olives, to the same place He departed the earth some 2000 years before. When His feet touch the mountain, what happens is amazing! 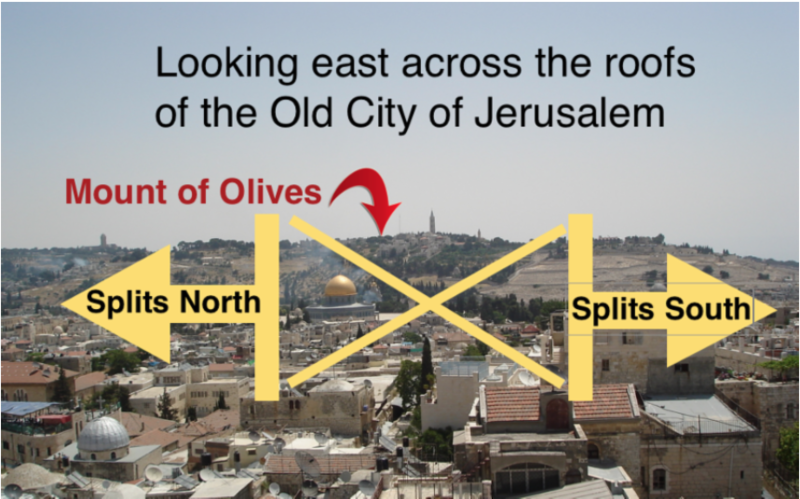 First, the Mount of Olives not only collapses, it also splits in half, moving north and south, leaving a large flat valley in its place. But that’s not all! 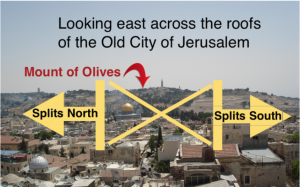 Splitting the Mount of Olives sets off the largest earthquake ever…a worldwide boom! This earthquake is so huge it affects the topography of the entire planet causing the remarkable collapse of ALL mountains worldwide (with the lone exception of Mt. Moriah). All of these earthshaking events cause a lot of smoke and dust to cover the entire world. Obviously all this worldwide shaking will cause the oceans to go crazy, scaring the bejeebees out of people watching all of this take place. All this worldwide phenomena are hard to imagine, but do keep in mind that this IS the conclusion to the horrible tribulation judgment on the world….a judgment that Believers won’t have to endure because God will have previously removed them via the Rapture. As the dust settles and the waves calm, Mt. Moriah will be raised to be the highest mountain on earth. All the mountains fall, all the islands disappear, Mt. Moriah is raised to be the highest mountain and the world will know Jesus has defeated Satan and is now reigning as King of Kings. But there’s even more to this story! From the raised Mount Moriah, gushing from the southern end of the Temple Mount, comes a perpetual river. 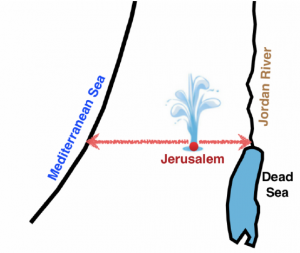 With the Mount of Olives and Mount Zion flattened to the east and west of the raised Mount Moriah, the water flows both west to the Mediterranean Sea and east to the Dead Sea. This “Holy Water” from God’s special place on earth will cause the Dead Sea to come alive! Currently nothing can live in the Dead Sea, but with God’s special water flowing into it, it comes to life as a fisherman’s paradise! With Jesus now rightly ruling as King of Kings, He judges the nations of the world from His throne that overlooks the newly created valley that is now adjacent to Mt. Moriah, where the Mount of Olives once stood. With the world’s mountains flattened, the weather will be more like it was prior to the flood. This means Jesus will reign without having to deal with harmful weather like tornadoes, hurricanes, tsunamis, floods and lightning strikes. 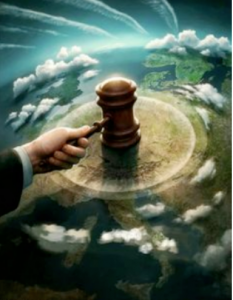 Best of all, imagine a world with Jesus righteously ruling as King, Satan is bound and everyone uses the Bible as the rule of law. Pinch me!